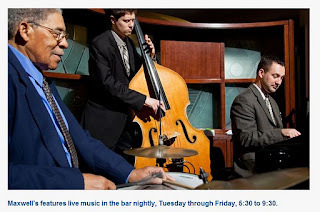 Did you know that you can enjoy live music at Maxwell's at the Club (East Bank Club, 500 N. Kingsbury, 312-527-5800 x301) every Tuesday through Friday from 5:30 p.m. to 9:30 p.m. Hear Gypsy Influence's unique brand of Flamenco music, incorporating Spanish classical guitar and percussion, every Wednesday. Robert Solone’s sets feature a richly-textured selection of show tunes, pop songs, original compositions, classical works, jazz and blues. The Joe Hurt Trio (pictured above) play a unique style of Chicago jazz that interweaves modern modal harmony with an old-school smooth style. Note: Tuesday evening's entertainment changes weekly; call Maxwell's to find out who's playing.